Many NFL fans are familiar with big NFL kicks in the postseason – Jim O’Brien in Super Bowl V, Adam Vinatieri in the Snow Bowl, Vinatieri in Super Bowl XXXVI, Vinatieri in Super Bowl XXXVIII. We have even seen a number of big misses in recent history – Blair Walsh missing a 27-yard field goal against the Seattle Seahawks, and Stephen Gostkowski missing an extra point versus the Denver Broncos. These all stand out due to the importance of the moment in which they occurred. But, as Chuck Zodda explains, in regular season history, one game stands out as the best game ever kicked in NFL history. There are nine games in NFL history in which a kicker has made at least six field goals with no misses and no additional touchdowns scored by his team. Seven of those occurred before Week 10 of the NFL calendar, making the meaning of the game difficult to discern due to changes in league standings in the weeks after. Of the two remaining games, one of them, between the Dallas Cowboys and Green Bay Packers in 1996 was a 21-6 affair in which Chris Boniol went 7-for-7 en route to an easy Cowboys victory over the eventual Super Bowl champions. But the remaining game stands out for a number of reasons. 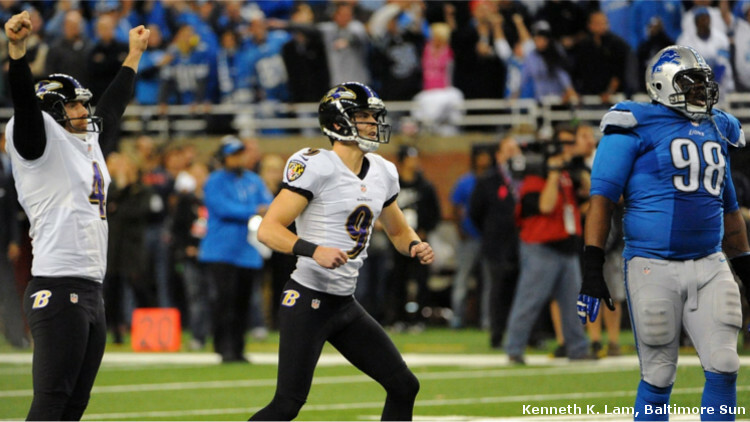 In Week 15 of the 2013 season, the Baltimore Ravens traveled to Detroit to face the Lions in a pivotal matchup for both teams. Baltimore had fallen a half-game behind the Miami Dolphins in the AFC for the final Wild Card spot, and playing on Monday Night Football, had a chance to remain tied with the Dolphins with a win. Detroit, on the other hand, was a half game behind the Chicago Bears in the NFC North, and with a loss, would also find themselves two games out of the Wild Card with just two games left in the regular season. Tucker, a second-year pro who had impressed in his first season by going 30-for-33 (90.9%), found himself 29-for-31 in his sophomore campaign entering the matchup against the Lions. With seemingly-endless range and impressive accuracy so early in his career, the Ravens had no problem turning to Tucker in the event their offense sputtered. But in this game, it would be Tucker, and Tucker alone, who would keep the Ravens in playoff contention. Detroit scored early in the first quarter, with the score remaining that way until early in the second. The Ravens drove deep into Lions territory, but were stopped at the 11-yard line, and forced to send out their field goal unit. Lining up from the right hash, Tucker buries a 29-yard kick to start his day and cut the Detroit lead to 7-3. Ho-hum. Later in the second quarter, Tucker was called on once again, this time after the Baltimore offense halted forward progress at the 6-yard line. From the right hash, and nearly identical location to earlier, Tucker drills a 24-yard kick hard enough to nearly knock the netting behind the uprights off its wire. 7-6 Lions. Not to be outclassed, the Lions displayed their offensive ineptitude on the next possession, picking up just 12 yards on five plays and punting to the Ravens. Baltimore drove to the Detroit 14-yard line before calling timeout with four seconds left and sending Tucker on to kick from the right hash once more, this time from 32 yards out. Tuck rips another strike through the uprights, putting the Ravens up 9-7 as time expired in the first half. But the fireworks were just getting started for Tucker and the Ravens. After neither team could move the ball effectively on their opening drives of the second half, Baltimore managed to get in gear and into Detroit territory before being stopped at the 31-yard line. While Tucker’s three earlier attempts had all been from short-distance, this 49-yard kick would present more of a challenge. Lining up from the left hash, where he had not yet kicked from during this game, Tucker lined up and prepared to kick. His motion stays consistent despite the longer distance, with his hips perfectly aligned with his target as he plants and strikes the ball. One Detroit defender comes within inches of getting his hands on the ball around the edge, but Tucker blasts the ball through the left side of the uprights with plenty of room to spare, putting the Ravens up 12-7 with 8:00 remaining in the third quarter. Double fist-pump from Tucker. After a David Akers field goal made the game 12-10, the teams traded possessions twice to start the fourth quarter, with Matthew Stafford throwing an interception that gave the Ravens the ball on the Detroit 34-yard line. They promptly went backwards one yard in three plays, forcing John Harbaugh to send out Tucker to attempt a 53-yard kick from the right hash. Right hash kicks are typically more difficult for right-footed kickers, as the momentum from the soccer-style approach can often create issues with the ball tailing outside the right upright. Tucker lines up with the same approach he showed in his earlier kicks. He is relaxed and loose throughout his set-up, and after the snap, drives toward the ball. Making perfect contact, he absolutely destroys the football, sending it dead-center with plenty of room to spare. Double fist-pump – the remix, Baltimore goes up 15-10. But Tucker is not done yet. Unfortunately, the normally-vaunted Ravens defense became a colander on the next drive, giving up 80 yards on 12 plays, capped off by a 14-yard touchdown to Joseph Fauria. The two-point conversion failed, leaving Detroit with a paper-thin 16-15 lead with 2:27 remaining in the game. The Ravens started on their 33-yard line after the kickoff and subsequent return, but picked up only 24 yards, finding themselves in 4th-and-8 from the Lions 43-yard line. NFL field goals are typically set eight yards behind the line of scrimmage to provide proper clearance for a kick. Including the 10 yards for the end zone, and carrying the one, this means Tucker was attempting a 61-yard field goal. At the time of this kick, only eight kicks of this distance or more had ever been made in NFL history. Lining up from just inside the right hash, Tucker stares down his target. He signals to his holder, punter Sam Koch, that he is ready for the snap. The ball rips back to Koch, who muffs the hold initially but recovers into position quickly. Tucker approaches the ball, and powers his right leg through it. His skip step carries him directly through his target, in what might be the cleanest mechanical performance I have ever seen from a kicker. The video of this kick should be shown to kickers for years as an example of how to properly follow through and trust your mechanics, even from distance. It is an absolutely flawless kick. It flies downfield, slicing through the air as it crosses the 30-yard line, then the 20, slowing as it starts to dip. The right upright looms in front of it, but it somehow manages to defy gravity and every other law of physics as it slips inches inside the right upright, and mere feet above the crossbar. A perfect night for Tucker. The greatest regular season game ever for a kicker.